Transportation officials want to take down or move 68 signs advertising places from York County to Fort Kent, but stiff opposition is expected. AUGUSTA — A proposed plan to remove or alter nearly a third of signs on Maine highways directing motorists toward secondary destinations is taking heat in many of the state’s cities and towns. The Maine Department of Transportation and the Maine Turnpike Authority plan would affect signs pointing highway drivers toward municipalities, regions, businesses, schools and other attractions from Cape Neddick to Fort Kent and many points in between, according to data provided by turnpike spokeswoman Erin Courtney. It would be done to conform with federal highway sign standards, altering 30 percent of supplemental guide signs on Interstate 95, Interstate 295 and Interstate 395, a five-mile road from Bangor to Brewer. Of the 68 affected signs out of the 225 total guide signs, 42 would be removed. The other 26 would be moved to points along the highway closer to advertised regions. Guide signs are typically brown with white lettering, giving exit numbers for destinations not immediately off of interchanges. For example, in Maine’s southern portion, a sign on the Maine Turnpike in Falmouth advertising Topsham would be taken down, as would one south of there pointing drivers to Scarborough Downs, a harness racing track. In Farmingdale, a sign for the University of Maine at Fort Kent — 274 miles away — would be removed, along with nearby signs telling drivers how to get to Hallowell and the China and Belgrade lakes regions. On Tuesday, the plan will have a public hearing before the Maine Legislature’s Transportation Committee. It’ll be an opportunity to watch sign politics in action. Officials in places just off Maine’s beaten tracks, such as Hallowell, think losing signs could hurt their areas. 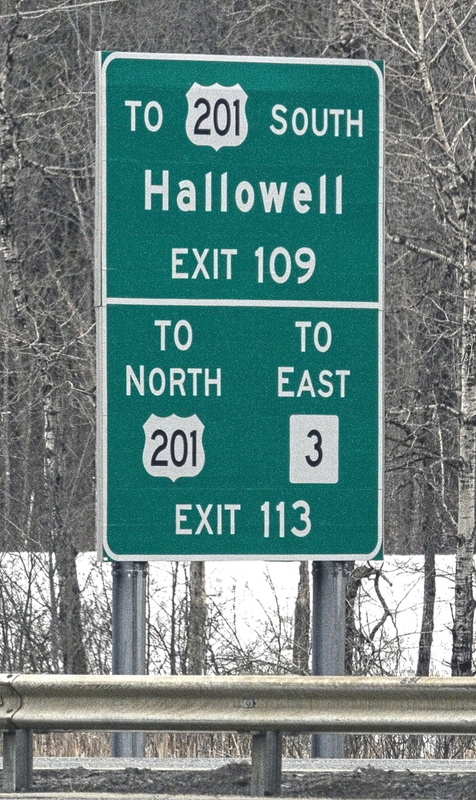 “Hallowell is a wonderful, popular destination, but is hard to get to through the web of interchanges and signs,” said Alan Stearns, a city councilor. Maine was the second state in the nation to ban billboards in 1977. Still, each legislative session, many lawmakers submit individual requests for highway signs promoting their regions. The state hasn’t had rules barring signs from going up, even though many of the signs don’t match federal standards, which apply population, distance and other guidelines to decide whether a sign is warranted. In a worst-case and highly unlikely scenario, Maine could lose federal dollars for having nonconforming signs. For example, Hallowell’s sign is on the chopping block because it doesn’t have enough people to warrant a sign under federal standards. Winthrop and Belgrade are already on signs for Augusta exits. The China Lakes region isn’t considered a large enough recreational area to have a sign. Last year, the Legislature directed transportation officials to create conforming standards that could be included in L.D. 1831, a bill the committee eventually could draft. Courtney said the proposed guidelines would create “an objective, uniform, consistent way to determine if someone can have a sign.” Officials in affected regions were notified recently of the proposed change. In response, the same lawmaking phenomenon that sprouted many of the signs could sink the dramatic proposal. There’s no objective way to know whether signs really help drive people toward destinations, and voting for a higher bar on signage could go against some constituents’ desires. “It’s a tough issue because you don’t want to disappoint folks who have grown accustomed to something they’ve found to be helpful for travelers going to their area,” said Maria Fuentes, executive director of the Maine Better Transportation Association. Jeffrey Woolston and Rich Roedner, town managers in Winthrop and Topsham, respectively, said signage is good but were agnostic on whether signs are big drivers of people toward their towns. Sen. Edward Mazurek, D-Rockland, co-chairman the Transportation Committee, said while the proposal is in its early stages and could be changed, the goal is to reduce “sign clutter.” Courtney said the turnpike hasn’t put signs up advertising park-and-rides off the highway because there isn’t enough room in some places. You could call the Scarborough Downs sign, and many others, advertisements. While it and signs for other places, including civic centers in Portland, Augusta and Bangor, would be taken down under the plan, all of those places would be eligible to rent space on signs near their exits, like the ones restaurants, gas stations and hotels already use. Susan Higgins, spokeswoman for the racetrack, said officials there are trying to learn more about the proposal; but she said employees have heard from customers who found the track by noticing the highway sign, and they want to keep representation on the turnpike. Mazurek said the committee’s clerk has reserved a second room because the committee is expecting a big crowd of affected parties at the Tuesday hearing. Even if the plan eventually passes, he said, it could be up to four years until the signs come down.